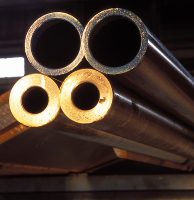 EMJ stocks tubing in multiple grades of, carbon, alloy, stainless and aluminum. Our inventory includes a full size range of carbon DOM and alloy and carbon seamless and welded tubing in both the cold and hot finished conditions. Stainless and aluminum tubing in commercial and aircraft quality are available as well as a full size range of structural carbon square and rectangle tubing.